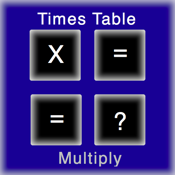 Times Table is an interactive learning tool for mastering the basic multiplication tables. The 1 to 12 multiplication tables are tested using a multiple choice methodology. Choices 2 to 4 are subsets of the complete table should you wish to practice only certain tables. With the Timed Table, see if you can complete the entire table in 300 seconds. The Special Table tests the 46 most important equations and the Manual Table allows you to choose which ones you want to answer. Scores are kept for all the tests taking into account the time it took to complete the table as well as the percentage that was answered correctly and the top 3 scores are displayed. One can also email the results should you wish to show off your mathematical skills. An information booklet is available in the app using the "i" button. For any queries or comments, please email pierre.marais@me.com.